An update regarding the Canadian Forest History Preservation Project: The Richard M Herring fonds (1931 – 2012). Another valuable collection of forest history primary sources diverted from the landfill and into the archives. I regret that I never got the chance to meet Richard Herring while he was alive. I’m sure that he could have shared many great stories about life both working and playing in North American forests. Mr Herring died in April, and it was via an email on a local forestry list-serve from Marian Hammond, Mr Herring’s former care-giver/personal assistant, that we were able to connect and shepherd this material into UBC Special Collections. Reading off of Mr Herring’s resume, we learn that he was born in the US, and he completed a Bachelor’s degree in Forestry at the University of Michigan. Mr Herring was variously a logger, a river driver, and a canoeman in several locations in the US and Canada. He was also an axeman on prospecting ventures in the Hudson’s Bay watershed. 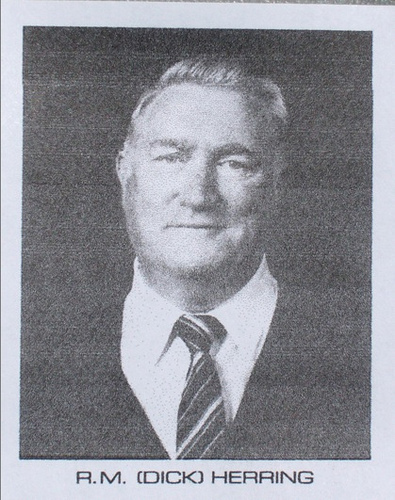 After 1958, Mr Herring worked for Alaska Lumber and Pulp, Canadian Forest Products, and then in 1985 he began work as a consultant out of Vancouver. Mr Herring’s collection will be a wonderful source for future researchers. It includes a large library of maps, correspondence, reports, and a fantastically broad range of visual records. These are glass lantern slides, more conventional 35mm slides, negatives, and movies of various film formats all of which depict forest activities such as logging operations, mills and hunting scenes. Sarah Romkey of UBC Special Collections was very happy to take possession of this material. Recall that we featured an entry by Sarah here previously, on UBC’s growing collection of forest-related material. Our thanks also to Stan Chester of the Forest History Association of BC for his assistance. Pingback: Treasured map collection finds a new loving home.